Cher is an American singer and actress. Commonly referred to by the media as the Goddess of Pop, she has been described as embodying female autonomy in a male-dominated industry. Cher is undoubtedly an Icon and at the age of 72 in our opinion looks better than ever. However, this is an old picture of Cher, when her hair was ridiculous and her costumes were barely there. 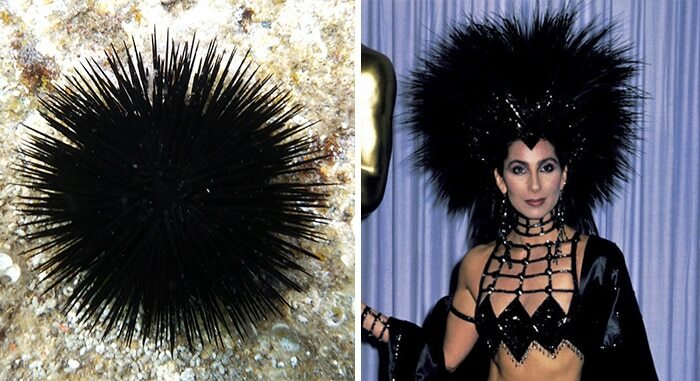 The singer has had Curls, mullets, wigs and great long extensions, and this poor hair choice is what led us to compare her with the Sea Urchin.